Of the nearly 40 species of flowering plants of the Genus Spathiphyllum, certain varieties are commonly known as "peace lilies,” though they are not true lilies at all. Different cultures across the globe have associated many meanings with peace lilies, and the European island of Ireland is no exception. While there is no "Irish peace lily," the recognizable flowers known as "peace lilies" hold a special place on the Emerald Isle. On the Emerald Isle the peace lily holds symbolism as an ode to fallen soldiers in the 1916 Irish Rebellion, also known as the 1916 Rising. An image of the flower depicting the dark green leaves, stark white blossom and orange stamen pays tribute to the Irish flag as well as soldiers who have died defending it and the freedom of Ireland. Around the Easter holidays, men and women all over the Emerald Isle wear a badge of the peace lily to honor fallen soldiers and remember the ideals of those who died to secure freedom for Ireland. True to its nickname, Spathiphyllum flowers known as "peace lilies" are standing symbols of peace and love around the world. As symbols of peace, these flowers are often sent as gifts of sympathy to those who have lost loved ones in an attempt to bring some peace to grieving individuals. Peace lilies also symbolize the rebirth and transcendence of the departed's soul from earthly life, adding to their appropriateness as gifts offering peace and love to the recipient. 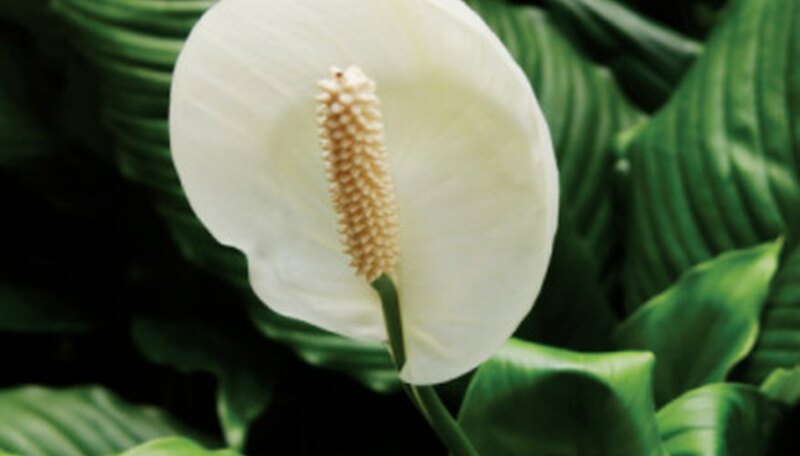 As is the case with many other white flowers, particularly lilies or flowers commonly called lilies, Spathiphyllum flowers known as "peace lilies" symbolize innocence, purity and chastity throughout Ireland and other areas of the world. With this connotation in mind, white peace lilies, like other white flowers, are sometimes symbolic of Christ-like virtue and the Virgin Mary. Peace lilies are symbolic of forgiveness and renewed trust, thus reinstating the peace that was once disrupted between friends, colleagues or loved ones. The Spathiphyllum flowers are often given in hopes of placating an offense, no matter how minor. Peace lilies are also given to convey the message of a presumed mutual trust between individuals.